Learn how SSH tunnels work by setting up a remote viewable Webcam on your BeagleBone Black. 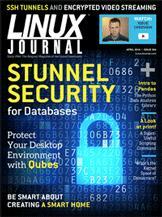 Improve database security with Stunnel. Doc Searls' EOF What's the Kernel Space of Democracy?